If you’re ever in Fez, Morocco, you must go to Cafe Clock. It’s an oasis amid the chaos of the medina, plus it serves great food, has free wi-fi and the staff are super friendly. Not to mention they have wonderful cooking classes – I found out first hand during a private lesson! I met my teacher Tariq at Cafe Clock and we made a connection almost instantly. He’s very personable and has lots of stories to tell. It was a real adventure wandering through the market with him as almost everyone we passed said hello – it was like being in the presence of a celebrity. Unfortunately a lot of the stalls were closed as it was Friday afternoon which is traditionally a day of rest in Morocco but there were still enough open to find some wonderfully fresh produce for us to cook with. As we stroll past a massive mound of green and purple figs I excitedly tell Tariq the name of this blog so he grabs a few to serve with the soup we’re going to make (that might sound strange, but I’ll explain more later). When we stop at the sweet pastry stall (also to serve with the soup!) I freak out about all the wasps that are swarming around. The pastries are dipped in a delicious honey and orange blossom flavoured syrup and the wasps adore it. As I wave my hands around frantically (I’m petrified of being stung) a man starts shouting at me in Arabic. Tariq explains that he is telling me to swot them away gently or I’ll start a wasp attack. I comply, but find it very difficult. Once we’ve got everything we need we head back to Cafe Clock to start the class. The first thing Tariq taught me was how to use spices for Moroccan cooking. He carefully spooned really fresh and fragrant spices into small glass bowls and arranged them into two groups. 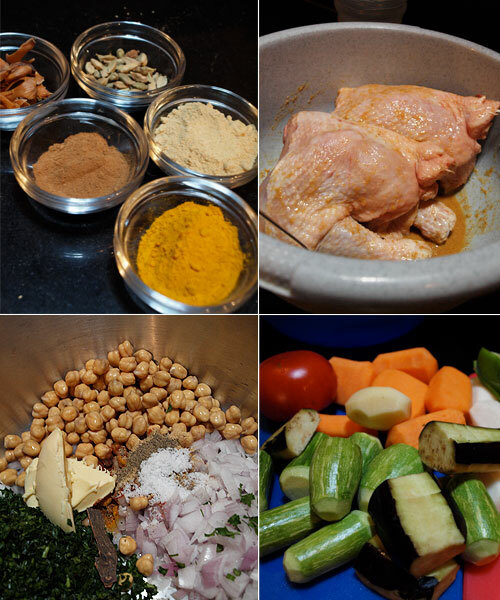 Paprika, ground cumin and black pepper are used for fish and vegetable dishes and mace, cardamom, ground ginger, ground tumeric and cinnamon (and black pepper) are used for chicken and meat dishes (see picture above). Although cardamom is specifically for lamb dishes. Once you know these basic flavour combinations it’s easy to get underway with creating delicious Moroccan inspired dishes. The next thing we did was prepare the chicken in a way I’ve never seen done before. We placed the chicken in a bowl and sprinkled it with lots of salt, ground ginger and white vinegar, then filled the bowl with filtered water and placed it in the fridge. This was done to ‘clean’ the chicken and rid it of any bacteria – a completely intriguing process to me as it’s unnecessary to do that back home in Australia. Lastly, we prepped all the vegetables in the traditional Moroccan way by cutting each one into small sections and carving the edges into rounded shapes to resemble, in Tariq’s words, ‘soap’. So cute. I had to include a picture of the gorgeous light fittings for my friend Lorraine. She’s a big fan of decorative lights and this one throws light onto the wall in a particularly pretty way. Cooking action shots. See how much I love the couscous? We got the harira soup started first as it needed a good few hours for the flavours to develop and for the chickpeas and meat to soften. It’s the easiest ever soup to prepare. One of those ones where you throw everything in the pot and let the magic happen. Fresh tomatoes (boiled and then rotated through a sieve to remove the skin and most of the seeds), chunks of lamb, beef bones (for the marrow flavour), chickpeas, onions, butter, coriander, small pasta shapes, parsley and spices. There’s lots of different versions and apparently in Marrakech you’ll find lentils or broad beans in the soup, but not in the traditional Fes version. Next we prepared the couscous. This was the most exciting part for me as *shamefully* I mostly use instant couscous. But not any more! This couscous was a medium grain and we steamed it 3 times – the taste and texture was infinitely better than any I’d ever had! It’s a fairly laborious task of washing the grains, steaming them over a pot of boiling water, removing them and adding salt and oil then fluffing with your hands and sprinkling with cold water until almost completely cooled. Repeat 2 more times. It’s a labour of love that’s well worth it, trust me! 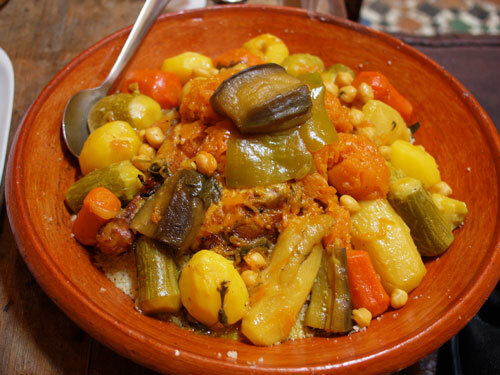 The reason I wanted to make the couscous with 7 vegetables was because of the story behind the dish. It’s traditionally eaten for Friday lunch as most of the shops and especially the bakeries shut down on Friday for religious reasons in Morocco. Since bread is a staple for every meal and the bakeries are closed, families eat couscous as the starch element of the meal. Of course I adore couscous (cooked correctly!) so that’s also a reason I chose to make this dish. The seven vegetables were pumpkin, eggplant, courgette, turnip, tomato, carrot, potato and green peppers. Ooops, that’s eight isn’t it? Oh well, more the merrier! There was also chickpeas in the couscous. Tariq used to work with a woman who was a relative of the King and she taught him some posh tips for making traditional food royalty-worthy. One of which was to add almonds instead of chickpeas to the couscous. This made it posh because almonds are obviously much more expensive (I guess the King can afford it). Another special tip he learnt was to double cook the chicken. We let the chicken cook in the broth with the vegetables so it got poached and incredibly tender and flavoursome as it soaked up all the liquid. But then we took it out for the last bit of cooking, smothered it in butter and roasted it in a hot oven to crisp up the skin. The combination of textures was amazing! I think that little boy wants some of my biscuits! This man is in charge of everyones food. It's a big oven. While the soup and chicken / vegetable sauce was simmering we got to work on the biscuits. I mixed the dough in the traditional Moroccan way in a large earthenware dish with my hands – no electric beater in sight! It’s very therapeutic to bake with your hands, feeling the gritty sugar and smooth butter on your finger tips. These biscuits were like a shortbread and were flavoured with honey, orange zest and orange blossom extract. We decorated the tops with egg yolk (that turned a yummy gooey brown when baked), caster sugar and toasted sesame seeds. I liked those the best. We carried them out into the street and to the public bakery – a massive wood fired oven that’s for public use. 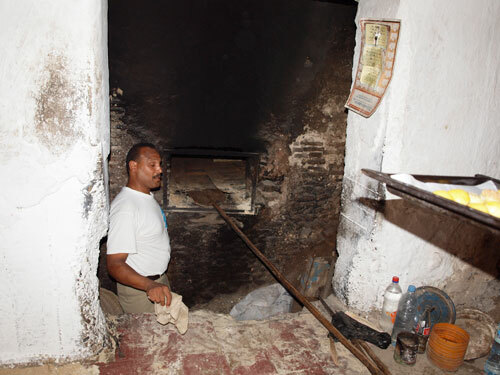 We wandered through the narrow streets of the medina and arrived at the bakery to find it closed! We then quickly rushed to another one and also found it closed. I was very disappointed. We were just about to give up when a Cafe Clock staff member hurried us to a third bakery and we managed to be the last cutsomers of the day – success! Baking the biscuits in the wood fired oven gave them delicious slightly smoky flavour and perfect crisp base. 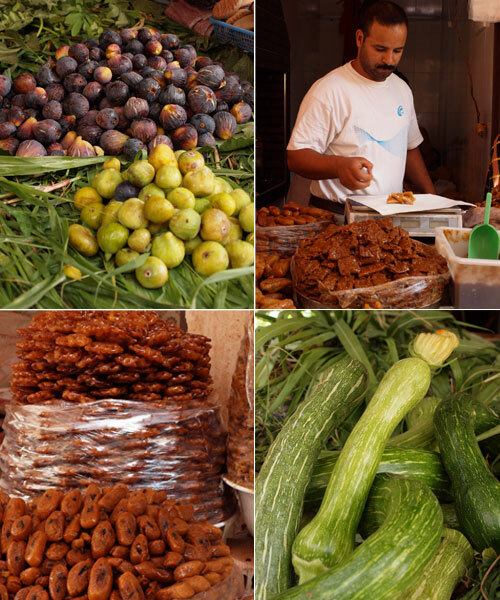 It’s very traditional in Morocco to eat sweet and savoury foods together. 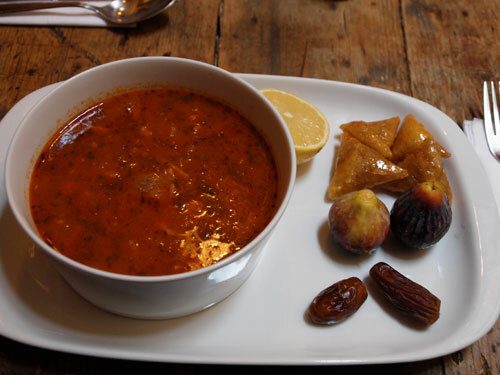 It was a little strange to sip the delicious tomato and lamb soup and then nibble on a sweet pastry filled with peanuts and drenched in honey. It was nice though. This looks like a small bowl, but believe me it was massive! We only finished about a quarter. That’s also the earthenware bowl I made the pastry in. Obviously I washed it out afterwards so I could serve the couscous in it. You can’t really see but the roast chicken legs are hidden under the layer of vegetables. The couscous is right down the bottom soaking up all the yummy juices. The green pulp is grated ‘courge’. A hybrid vegetable of cucumber and courgette (zucchini). It’s mixed with caster sugar, cinnamon and orange blossom extract and was very refreshing! 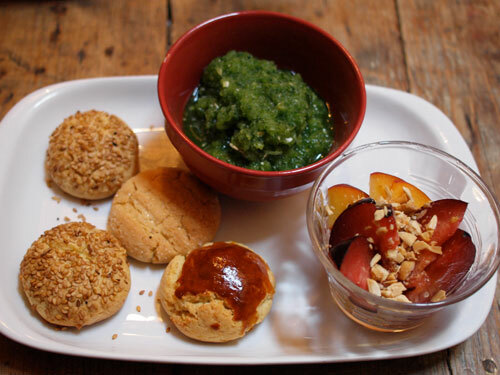 The little fruit salad is fresh plums with crushed peanuts. I highly recommend this course. I had the most fabulous day out and cannot wait to get back home and try out my new skills. Want to do this course? Email Gail at Fez Food. Great meal. Great post. Thanks Christie and Tariq! That looks amazing darling! Will you make some Moroccan treats for us when you get back? Thanks so much for this amazing tour-it’s a real glimpse into life in Morocco that’s so far apart from 5 star hotels. Fascinating how they use a public oven too. I’m so jealous Christie! 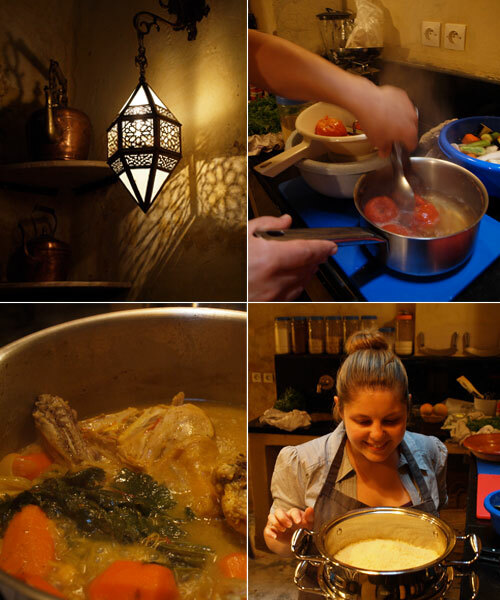 What an amazing experience from start to finish…I bet you can cook like a real Moroccan when you get back. I feel like i have just traveled to a far off place. Thx, it was a delight to read…and then there is that market and your food…….unbelievable!!! Oh my, I wish I could be there! So jealous!! That looks amazing!!! And check out the figs!!! I might just so crazy there!! That looks like so much fun! It’s an interesting idea to poach and bake the chicken. The public bakery is amazing too. I guess it’s easier not to have to preheat the oven, especially if it’s wood fired. Morocco is high on my list of places to visit and I’ll definitely have to take a class from this guy if I’m ever there. What a great idea! We’re jealous! 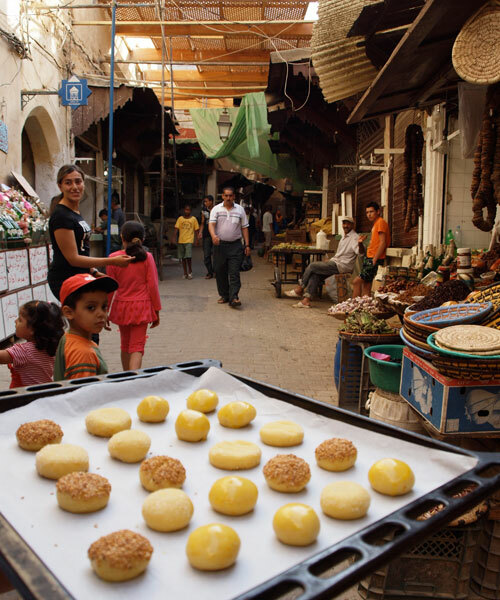 Sounds like an awesome experience :) We saw one of the public bakeries, but didn’t get to do any baking — love your shot of the tray in the medina! So happy you loved the Clock Kitchen cooking class so much. Anyone who wants to book this or any other Fez foodie adventure please contact me, Gail, at Fez Food. Culture through food….yum! Thanks for your great write up Christie wish I could have met you. je cherche à savoir ce que sont les ‘TERFES’? Hi Poirier, I think a ‘terfes’ is a type of vegetable, but I’m not really sure, sorry. I’ve just been to Morocco and we went several times to Cafe Clock as it is just such a wonderful place to relax in the middle of the medina. Unfortunately didn’t have time to do a cooking class but who knows maybe next time. It’s definitely a place to visit when in Morocco.